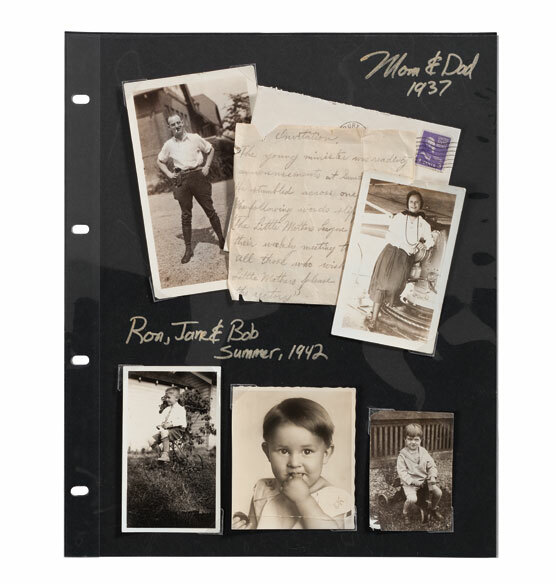 Black Mylar® 4-ring sheet protectors are a great way to protect photos and flat memorabilia. Both Mylar® and our heavy paper are archival. Already had the scrapbook--needed more pages. Love your books. I coose this item because I already bought the 4ring photo album personalized and was VERY happy with the quality. This will help me complete my project as I have several items I want to include in album that are not photos. I will use this for postcards to add between the photos. I will use these for 8X10s as well. For my grandson's photos and sports information. I plan to use those sheets to separate the different "chapters" of my collection, and to display large-sized documents whose color is predominental white or cream-colored. A black background ought to enhance their appearence. I use these for my older black and white photos, but they work well with any others as well. to archive the various certificates of achievement my sons are accumulating over the years. Because I have kept an annual jornal of the main events in our family. I have been doing this for over 20 years. I can put different sized items in here that I am free to arrange how I like. 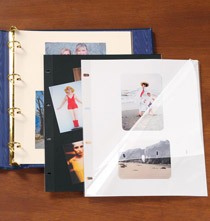 I have large photos that will not fit in the regular pocket pages for the 4 ring binders. Allows for odd sized or larger pictures that I want to include. To preserve special old photos that are also scanned into my computer. And can add some family history captions. Right size, acid free, nice weight, looks great. I needed them for a scrapbook!! It was the only option for an old album I have. What is width and length? BEST ANSWER: Thank you for your question. The page is 11 9/16" x 14". We hope this information will be of help to you. BEST ANSWER: No they are not magnetic, meaning there is no magnetic materials (such as those pliable thin fridge magnets) used. The Mylar tends to stay in place by some sort of static electricity phenomenon. 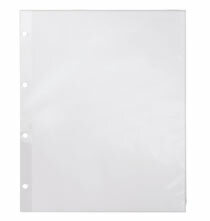 Thus, if the documents (single sheet of paper such as a letter, or an envelope) are thin enough, they should remain in place without needing setting to the Black insert. 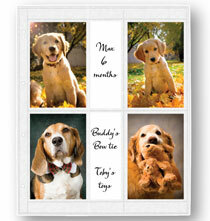 On the other hand, postcards, birthday cards, thick or multiple photos, will not remain in place at all. They will have to be set with photo corners, or some other means. 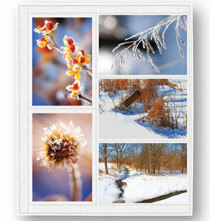 To use photo corners it is advisable to carefully plan your layout on the Black insert, using a ruler. Photo corners are very difficult to remove, without damaging their support, once glued to paper. I hope this helps. No, they are not magnetic. I just find them so helpful if so like making big photo books. Photo CDs are fine, but I want to hold a photo book in my hands. I collect fire truck photos. This has been the best way for me. I have bought hundreds of pages. Are these photo pages safe for old photos? I have no negatives. BEST ANSWER: Yes, because my hobby is making scrapbooks with current and vintage photos. Some of my books have 60 and 70 year old photos. It all works great. Some of the photos are one of a kind press photos. BEST ANSWER: Thank you for your question. We do not have 5 ring albums or pages. We hope this information will be of help to you. What is the usable width? What is the overall width?